I can’t believe it’s been months since I’ve posted a brownie recipe. What’s wrong with me? Where has my sanity gone? Thank god I’m comin’ back with these BOMB RED WINE BROWNIES. Hubba hubba. Being a girl who likes to stay fit, I constantly struggle with the decision of drinks or dessert. Because, like, I want both. But too often I choose one over the other in an attempt to not over-indulge. Right, girls? You know what I’m talking about! 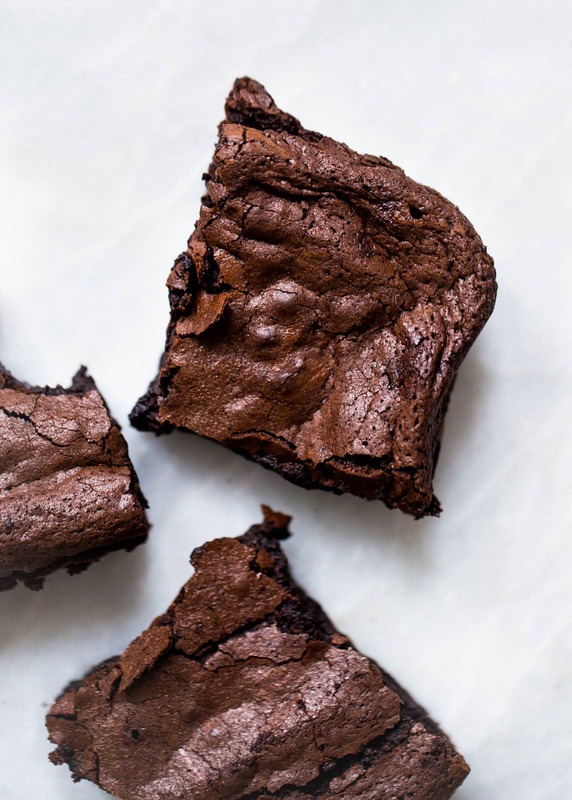 Well struggle no more, because this homemade brownie recipe is the best of both worlds: a boozy brownie spiked with red wine. It’s thuuu guuud. Why so good? Well, obviously because red wine. But in addition, this red wine brownie recipe cuts back on the butter in favor of extra chocolate. The chocolate acts as a fat in the recipe, while also delivering that chocolate flavor, resulting in a seriously rich brownie. I also used a high-quality cocoa powder (Rodelle Baking Cocoa aka the only cocoa powder I use. 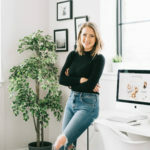 Though I am a brand ambassador for them, this is not a sponsored post; I am just so totally in love with their products and can’t recommend them highly enough). Last, brown sugar is a must. It adds a wonderful warmth that you just don’t get with granulated sugar. I almost exclusively use brown sugar in my brownie recipes, and suggest you do too—just sub it 1:1. Use unsalted butter—Typically, I prefer using unsalted butter in my brownies because I like to control the amount of salt that goes into them. I always add a pinch of salt to draw out that rich cocoa flavor, but adding a pinch of salt on top of salted butter is a bit too much, you know? Use room temperature ingredients—When you put the brownies in the oven, you want them to start cooking right away. If you use chilled eggs and butter, the brownies will first have to heat up in the oven and then cook, which will result in an uneven bake. Use a good quality red wine—You don’t need to buy the most expensive wine at the store, but something better than a two buck chuck is a good call. Remember: the better the ingredients, the better these red wine brownies will taste! Bake until mostly cooked—You want to bake these brownies until they’re mostly cooked, but not all the way done. To test this, stick a knife in the middle of the pan; if it comes out mostly clean, take the brownies out. They’ll continue cooking in the hot pan and will wind up being super fudgy and moist. Anywho. It being Monday and all, I’m destined to watch The Bachelor with some girlfriends (go ahead, judge me, I hate myself for it) and nosh on these red wine brownies. Best. Night. Ever. Preheat oven to 350°F. Line an 8″x8″ baking dish with parchment paper or oil. In a small saucepan over low heat, melt the butter. Once melted, add in chopped chocolate, stirring constantly until the chocolate is melted completely. In a standing mixer with a whisk attachment, add in brown sugar. Slowly pour melted chocolate mixture into brown sugar with the mixer running on medium speed. Add in eggs, one at a time, with the mixer still on. Beat for 30 seconds, until the color of the batter lightens just a bit. Turn the mixer to low and add in cocoa powder, flour, salt, vanilla extract, and wine, beating for an additional 30 seconds. Pour batter into prepared pan and bake for roughly 40 mins, or until a knife inserted in the center of the brownies comes out mostly clean. Woah, these look like the best, most fudge at brownies!! My, oh my these are a chocolate lovers dream come true and quite possible the new girls night in necessity. Keep your wonderfully creative recipes and beautiful photography coming! Thank you so much for the kind words, love!! They are just ridiculous. Enjoy! What cocoa powder are you using I really want to make a low calorie choc smoothie but cannot find a low calorie cocoa powder anywhere!? Hi Holly! I used Rodelle’s unsweetened baking cocoa. Sarah, red wine and chocolate are a prefect union! thanks for the recipe and beautiful photos! Hi! These brownies look amazing! Definitely going to share this with my three grown daughters! One question: What KIND of red wine? Dry? Sweet? Semi-Sweet? Hi Jana! I recommend a dry, medium to full bodied wine like a Merlot or Cab Sauv! These brownies look incredible.. I love baking with red wine! And hooray for The Bachelor!! Do they taste like wine? Just curious what the wine does for the brownie? These have seriously made my day and I can’t wait to make them! Red wine + chocolate is pretty much everything. My Monday so needs these brownies! These are unreal and I cannot wait to make them! And YES to the struggle of wanting drinks and dessert. I get you girl! A boozy brownie?? What’s not to love? Drinks and dessert all wrapped up in one delicious brownie…YES!! Seriously?!? Red wine brownies? Gimme these ASAP! Cannot have alcohol because of health reasons, do you have alternative liquid? I have made brownies with coffee as the liquid, always turn out amazing, with just a slight coffee flavor. If I had to live off one dessert for the rest of time, I’m pretty sure these would be it. Chocolate + booze = SOLD! I am confused why you can’t answer my question and you haven’t let it post to your website? It makes me think you have something to hide? I want to know what the red wine does for the brownies? Do they taste like wine at all? Hi Morgan! Your question wasn’t yet posted because if you are new to my site, your comment gets moderated to make sure you are not a spammer. The red wine gives a great acidity to the brownies, and results in a slight red wine taste. It is not a strong taste at all, simply a slight fermented taste from the wine. If you don’t like wine, you can substitute equal part water. You know the way to my heart – combining two of the most delicious items on the planet into one. Yes! Another blissful brownie, Sarah! We can’t wait to make these up…we may or may not share with the team. OMG! I’m so excited for this recipe. I made Erin’s red wine truffles last week and they were a big hit AND of course I now have an open bottle of red wine in my cabinet, so the timing could’t be more perfect. Hooray! Also, would never judge you for eating chocolate and watching reality TV! Yummy! This brownie recipe looks easy, Sarah! Can’t wait to try them, I hope they look as delicious as they look. OMG, I’m SO happy to hear that! I have to say, I was pretty stoked with them myself, but to hear that you all agreed is just fantastic! Thank you Sara Beth! I am DROOLING over these! Look so moist and delicious! Do you think i will be able to switch the red wine to equal portion of bourbon? Omg yes, please do. Ha! Delicious!! Very rich and chocolatey. They don’t have a strong red wine taste, I’m sure it just adds to the richness. I also love your tahini bars! Made these this weekend for a party — they turned out perfectly! They tasted sophisticated and so delicious. Everyone loved them. I added 1/2 cup of chopped walnuts to break up the dense chocolate just a little bit. So fun, thanks so much! Oh I’m SO glad you enjoyed them Jamie! Thank you!!! haha, I KNOW what you are talking about!! These brownies look beyond amazing and I definitely think I should try it soon. I measured in US quantities, so hope that helps! Enjoy, Nina! Hi Sarah, the recipe looks amazing and I can’t wait to try it out! Quick question, what do you think about substituting red wine with port? Would that work? Hi Anna! I would not substitute port if you’re looking for a similar taste. The alcohol content, as well as the overall sweetness, will differ completely, so the taste will not be quite right. However, if you prefer the port taste, then you totally can! 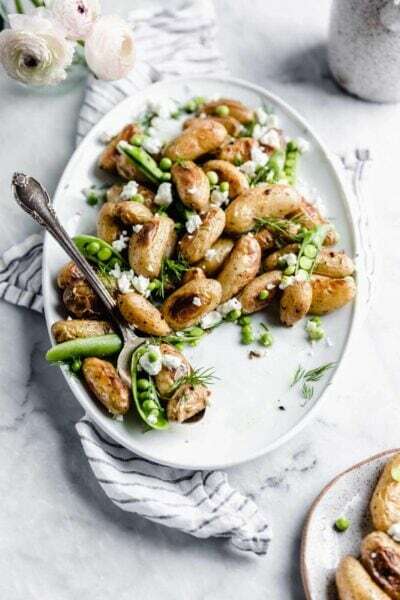 Yum, just found this recipe and want to try next week. Obviously will depend on how big I cut the brownies, but approximately how many serves will this make? Never mind, did the maths. The conversion to Imperial threw me! Thanks for the recipe, look forward to making these! Red Wine Brownies sound wonderful. I wish there was a tad more wine in them. If I wanted to make these brownies in advance of an event, do they freeze/thaw well? Can you substitute other flour, have a daughter that loves Brownies? Hi Ingrid! I have not tried, but since it’s only 1/4 cup in the recipe, that should be fine. Just to clarify… is 1/4 cup of flour right? I don’t have a stand mixer, can I use a hand mixer? I do have a stick blender with whisk attachment, but that might be a bit much to hold the entire time. Thoughts? Hi Amber! Yes, you can use a hand mixer! just made these! If you like super thick, rich, and fudgey, like me, these are definitely for you! (I also added some chocolate chips into the batter before baking). Also, you cant even taste the red wine (at least not in mine)! Amazing taste. My co workers loved them. My only issue was they cracked so much after just 30 minutes they were hard to cut without falling apart. I made these and they were great however for clarification do you pack the brown sugar like you do for other cookie recipes or just shake it out. They were a hit at home and the office. I am having them for dessert tonight with some vanilla ice cream and a raspberry sauce…. THese are AMAZING, I’VE MADE THEM TWICE!!! 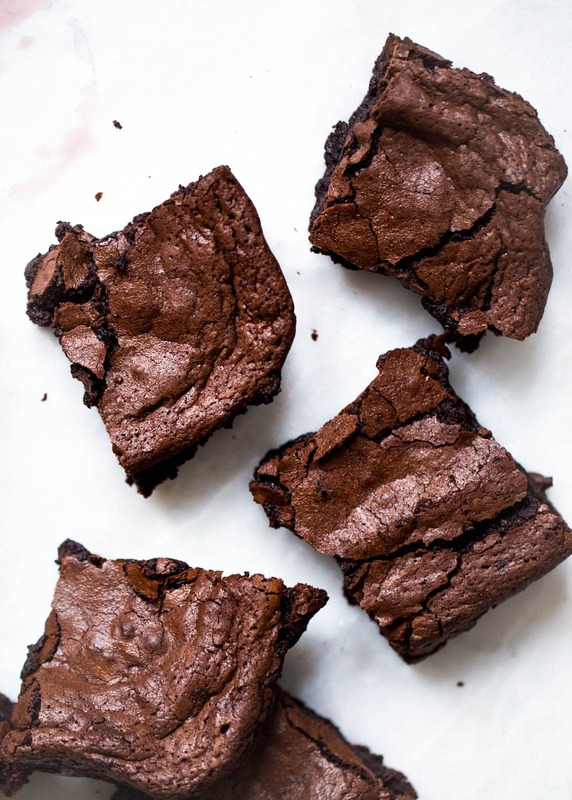 Definitely ONE OF MY TOP 3 BROWNIE recipes EVER ( ITS THESE AND YOUR MOCHA BROWNIES), SUPER fudgeY & RICH, AND IF YOU’RE A CHOCOHOLIC LIKE ME-FINALLY A recipe WITH enough OF A CHOCOLATE PUNCH. LITERALLY HAD A FOOD-GASM EATING THESE. ALSO, WOULD THESE BE GOOD FOR YOUR BROWNIE STUFFED CHOCOLATE CHIP COOKIES? 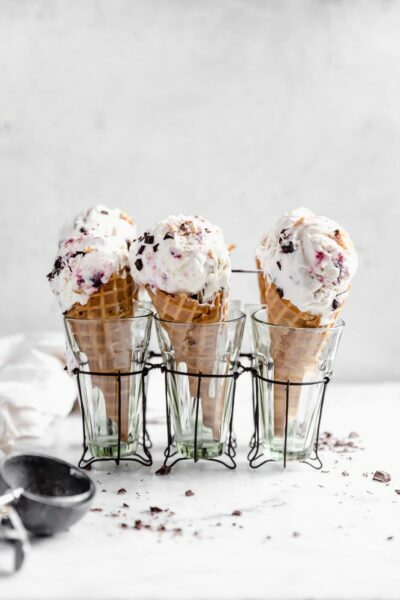 I know you said a box mix, but I figured since these were really fudgey would they work as well?- I have half a batch left cause I was thinking about using the other half to mix into your no churn coffee ice cream (instead of the oreos)? Hi Sarah! Could I replace the red wine with almond milk? Well…I had planned on a baked apple crisp with caramel sauce for Christmas dessert but your Red Wine Brownies look fabulous and will now be my dessert! I can’t wait to try them! What type of red wine, sweet, dry, or middle of the road? 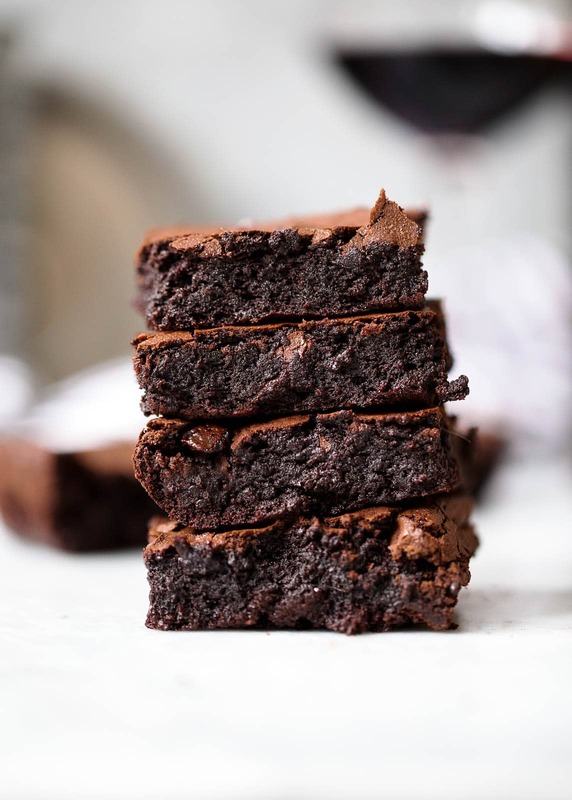 These red wine brownies are so Instagrammable and adorable! As you know I made it a short while ago and it was lovely! Thx for sharing!